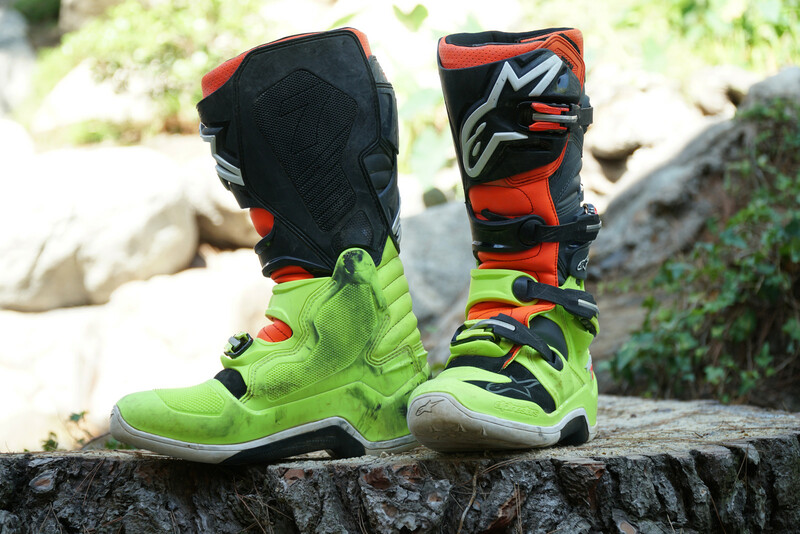 We put tons of hours in Alpinestars’ mid-level motocross boot that even the pros wear. These boots have been around a while, so don’t freak out and think that these are some new version. That will be the Tech 10 very soon, but here I’m talking about the Tech 7 MX Boot. Since their introduction, the Tech 7s have had a redesign in 2014 making the boot lighter and slimmer than the previous version. I’ve had this set of boots for about a year and, while I haven’t ridden in them exclusively, I’ve put a ton of time on them. At a quick glance Tech 7s can be confused with Tech 10, that is, until you count the buckles. The main design feature they both share is the replaceable welded outsole (non-stitched) that gives it that sneaker-like look. There is no booty, but that has pretty much become the norm in motocross boots nowadays. Style-wise, Alpinestars really knows how to put some crazy colors together to give riders a truly impressive array of options. Pictured is the Yellow Fluo/Red Fluo/Gray/Black and even though it is bright it is still one of the tamer colorways. The fit is very comfortable, meaning there is a generous amount of room without being too loose and giving the foot too much slop. It’s definitely not that super-snug, cast-like wrap feeling that Tech 10s have. I wear a size 10 (10.5 normal shoe) and a size 10 Tech 7 fits great. One thing I can say with nearly a year in these boots is that they do get a little looser with time. I think it is the padding in the ankles, in the toe box, and the insole just sort of lose some of its firmness. Not so much that the boot is now too loose, or that the boot is uncomfortable, but when I wear these Tech 7s, I make sure to wear thicker moto socks rather than thin sport or compression socks. If you have a very narrow foot, these might not be the best choice. If your foot shape is neutral-to-wide, you’re golden. Some buckles, as they age, become harder to operate because of grit and wear. Or worse, if the are made of plastic at the contact points, can go the other way and wear out all together. While the Alpinestars “arrowhead-into-slot” design has still works fine (and is the same on the Tech 10s), I’ve splashed some lube on them. Meaning, after about three or four months of riding and pressure washing, the hinges started to get difficult to close. I quick zap with MPPL, WD-40, 6-in-1 or your favorite all purpose lightweight lubricant does the trick. I would much rather have buckles that stay tight and are less likely to open while riding that buckles that get looser and looser over time where they just flop open on their own. One small gripe I have is with the first (foot) buckle - for some reason the strap doesn’t want to adjust tighter (go further into the boot) than a certain point. When I first got the boots, this was OK since, as I said, the padding inside felt full and thick. Now, having a little more room, I would like to push the strap in just one or two more clicks but it seems to have bottomed out. Full disclosure, I’m not the hardest on soles. I sit down too much, don’t pressure the outside peg like I should and, overall, I’m not a blitzing any whoops bigger than what’s on the pee wee track. That being said, these have held up extremely well. I’m nowhere near needing to replace them or just the center part, which is replaceable independent of the rest of the sole. Grip on the pegs isn’t fantastic, but I would look at getting sharper pegs rather than softer boot soles, and I’ll take this longevity any day. Some riders complained about pedal numbness with the boots when they first came out but with the latest version of the Tech 7, I don’t have any issues finding the shifter or brake pedal. In a motocross boot, range of motion vs. support/protection is something manufacturers have to balance. With the Tech 7s, Alpinestars is more generous with its range of motion than gnarly protection. Yet with a year’s worth of riding in them, these boots don’t seem to have lost any support they started with. Outsole support is still firm and I don’t have excessive bending in front end of the boots from walking and from riding on the balls of my feet. While I play nice with boot soles, I’m actually pretty hard on the inside of the boots. I grip the bike like a vice with my ankles and you can see a fair bit of discoloration and marring where the boot makes contact with the bike. Bike feel, by the way, is excellent. I can really get a seamless weld on the bike with my legs and don’t feel any hot spots or have any hang-up issues. While the boots might look a little beat up from the bike, this hasn’t, nor will it, affect the function or performance of the boot. Long days of riding and walking around, the slightly lighter and more flexible design of the Tech 7 is appreciated over heavier, stiffer boots. Yet, if you are a hucker that can’t help but send it constantly, perhaps the Tech 7 might not offer the ankle protection you would want if you a temporary lapse in skill. One-piece injected dual compound foot shell with co-injected hard toe protector and integrated steel shank. Upper constructed from microfiber material. Contoured calf protector plate. Dual compound sole.